The SCOUT Wireless Portable Charger packs a 5,000mAh power source with built-in cables with support for microUSB, USB-C, and Lightning. And, even better, it has wireless charging capabilities. Compatible with Qi-ready phones like the Samsung Galaxy S10 and various iPhones, it’s all you need to stay juiced on the go. Normally, you’d spend about $80 for the SCOUT, but we’ve got it listed for half price right now. That’s right, the all-in-one charger can be yours for just $39.99. You can purchase the SCOUT 5000mAh Wireless Portable Charger through the AndroidGuys Deals Store. Act fast and pick yours up for just $39.99, earning yourself a massive discount (50 percent off) in the process. Don’t have a wireless-ready smartphone? Double the capacity to 10,000mAh instead and we’ll still take half off the cost. That’s enough juice to power your typical phone three times over. Headphone jacks on phones are almost dinosaurs these days. With the exception of Samsung and LG, most phone makers have removed the 3.5mm input. That has brought a renaissance of wireless audio devices to emerge over the last few years. Apple released AirPods back in 2017 and while they do work on Android, many of us have been waiting for the “Googled” version. A relatively new company, Mobvoi, has heard the call and released the TicPods Free earbuds late last year. 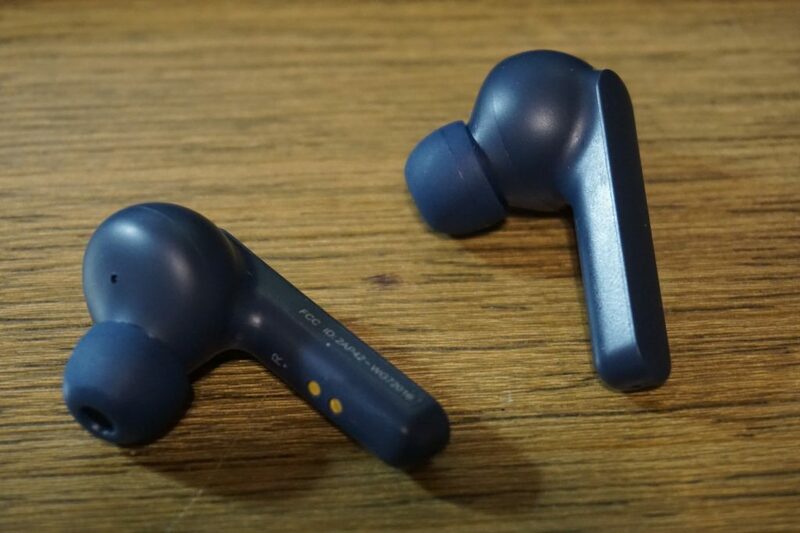 While they initially look like a colored knockoff of AirPods (which is a warranted first take), they offer some unique options for those of us looking for sleek Bluetooth earbuds for our Android phones. As mentioned the hardware design is very similar to Apple’s AirPods. The earbuds have a teardrop style earpiece with a long stem that protrudes outside and down the ear. The packaging includes two different size silicone tips for a snug fit in most ears. One thing that surprised me was that the TicPods are covered in a soft touch coating. It offers a nice tactile feel to just slick plastics used in many electronics. Also covered in this same material finish is the charging case. One downside of the soft touch covering is that is prone to showing fingerprints and oils. The case will charge the devices when away from the outlet as well. Mobvoi rates the overall battery life of the TicPods earbuds and case combo to last 18 hours, but more on that later. One separation point for the TicPods Free earbuds and other devices are the touch controls built into the stems. They are also unique depending on which earbud you use to input touch. You can adjust the volume for music or phone calls by dragging your finger up in down from either earbud. Both will also skip to the next song with a double tap. This one is confusing as both offering input, but there’s no way to go back a track and only the next song can be initiated. A long press of 2 seconds offers you play/pause while listening to music on the left bud. The same on the right TicPods will launch Google Assistant on the left and will reject a caller while the phone app is ringing. The left earbud offers no other features during a phone call. One last interaction is that each bud has in-ear detection. If you remove them for any reason, the playback will stop. Want to resume where you left off? Simply put the earbud back in your ear. It’s a little trick that really comes in handy when around other people to quickly ask, or answer, a question. Let’s be honest, if you are reading this review you really just want to know how the audio sounds, right? Well, it’s just OK. The sound is crisps and clear, but I think they could be louder overall. While they have passive noise isolation, I have had times in a busy room where they just weren’t as high volume as I’d like. Other devices like my Pixel Buds offer a more robust sound in a wired format, but maybe this is too be expected from the new wireless world. It doesn’t deter me from using the TicPods Free, however. I really like the form factor and portability of the earbuds. Speaking of portability, I’ve found that the 18 total hours of playback with using the case to top off the buds when not in use is pretty close to my results. I get about 3 and half hours of mixed usage between phone calls and music with the buds and can top off at least 3 times with the case before reaching for the power cord. I do with that cord was USB-C too. Micro USB is so 2016. 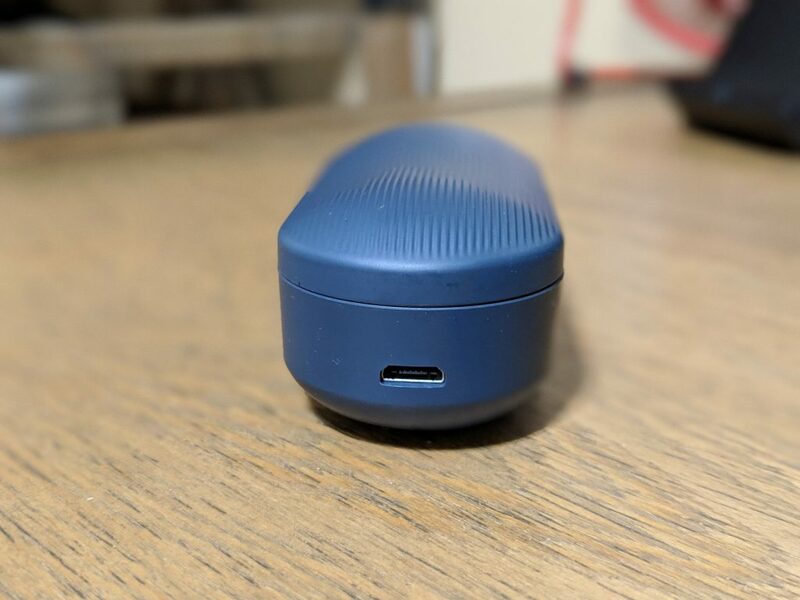 I really enjoy the TicPods Free wireless earbuds from Mobvoi. The company is quickly building a nice portfolio of Android accessories that’s pretty impressive for the budget minded. The TicPods will set you back $129 dollars and come in 3 different colors: Ice White, Lava Red, and Navy. You can pick them direct from Mobvoi or Amazon right now.